A placement on one of our volunteer Care projects in Morocco can be challenging, but the effort will also prove incredibly rewarding. Volunteers help to improve the quality of life for the children in a variety of homes, centres for disadvantaged children and disabled centres, where staff simply don't have time to provide the individual care and attention that the children require. 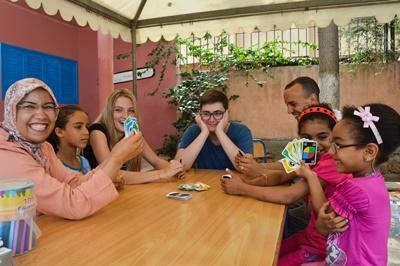 You can gain work experience on a volunteer Care project in Morocco whatever your age, abilities or level of experience; whether you are on a gap year - or even a gap month - from further education, or are coming to us during a career break. All we ask is that you have enthusiasm for and a commitment to the work, the staff team and, of course, the children! All volunteers on a Care Project in Morocco should speak some basic French in order to communicate directly with the children and the local staff. Our Care volunteers in Morocco are based in and around Rabat, an ancient but rapidly modernising city. Most volunteers work in centres for people with special needs or in support centres for disadvantaged children. Some of the children will have lived on the streets or come from very poor homes and have perhaps never attended school. In whichever volunteer Care project you find yourself, you need to be ready for a challenge. Many of the children will have health or behavioural problems, or may require extra attention due to a range of disabilities. Our team in Morocco invites a care resource trainer to run workshops with our care volunteers at the Rabat office once a month. The workshops provide care volunteers with valuable ideas and information on how to deal with various children at the placement and the children’s individual needs. You will also discuss useful strategies to try out at your placement and be given a variety of resources relating to activities that can be used at the placement. There is a great deal you can do to contribute to the general care and support of the children. The work depends a lot on the ages of the children you are working with. Volunteering may involve assisting with the day-to-day practical care of the children; ensuring they get up on time and preparing their meals, as well as playing games, organising activities and trips, and offering the children the vital one-to-one attention which they crave. You may even find yourself assisting with ‘zoo therapy’ where disabled children have the chance to interact with and feed animals like rabbits and lambs. Or you may join a fun play scheme to teach the children circus skills! 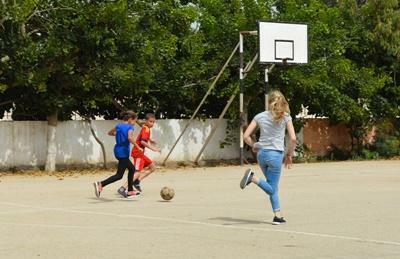 Volunteering on a Care Project in Morocco makes a real difference to the organisations we work with. Your help not only stimulates the children but also alleviates the stress felt by the overstretched staff. It will certainly be an experience that those involved will never forget. You can join a Care project in Morocco for two or three weeks if you don't have time to join us for four weeks or more. This project has been selected by our local colleagues as being suitable for short term volunteering for both the host community and the volunteer. Although you will gain a valuable cultural insight and work intensely within the local community please be aware that you may not be able to make the same impact as someone volunteering for a longer period.